Sorry there is no real update on Sabrina. The beading is driving my crazy and very time-consuming. 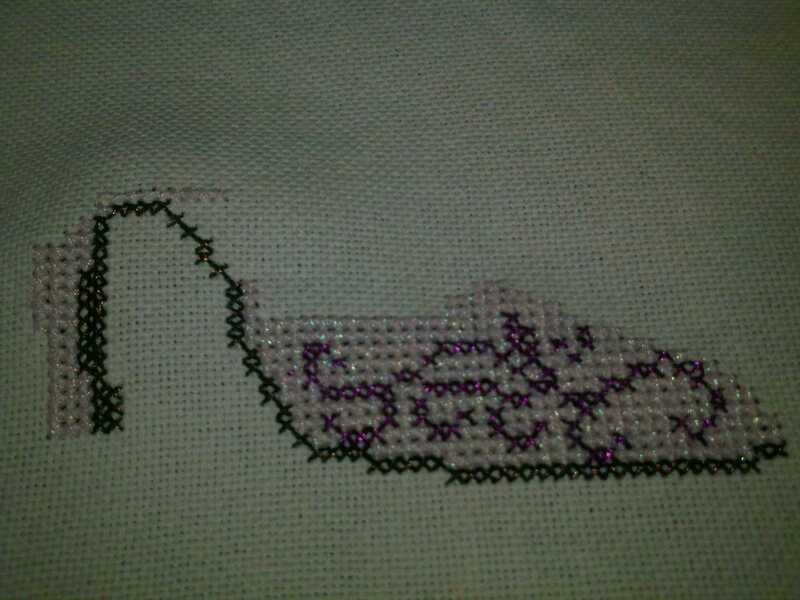 So out of utter frustration from stabbing myself with the beading needle I turned to working on completely my 4 part shoe collection. Except it turns out I don’t like any of the shoe patterns I had. So, off to design my own. Alas, I came up with a modern take on Cinderella’s Slipper. Instead of glass, and thus a mostly white shoe, I chose to give the shoe a more icy look using DMC light effect floss. This also brought in more blue into the pattern. The pattern came out great. The hardest part is working with the light effect floss and keeping the similar shades of blue separate. I am really going to push to try to finish Sabrina this month, but we will see if I can find the time, especially as I believe I am going to switch gears for the next project and attempt my first Heaven and Earth Design, Wrath. I would love to see pictures or updates on what everyone else is working on. 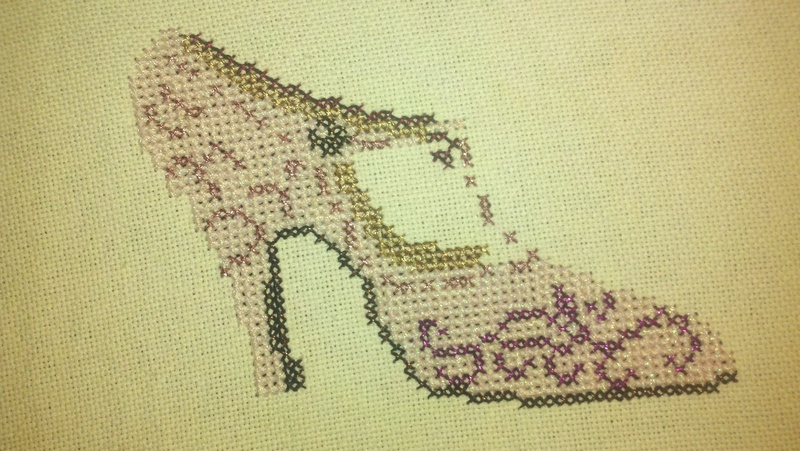 I set aside my big cross stitch project because I needed to actually finish a cross stitch immediately. 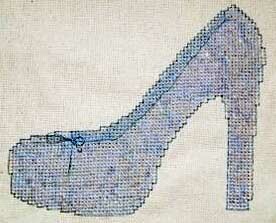 So I took up the second of four old fashioned shoes patterns. These shoes are being done in the new DMC light effect threads. 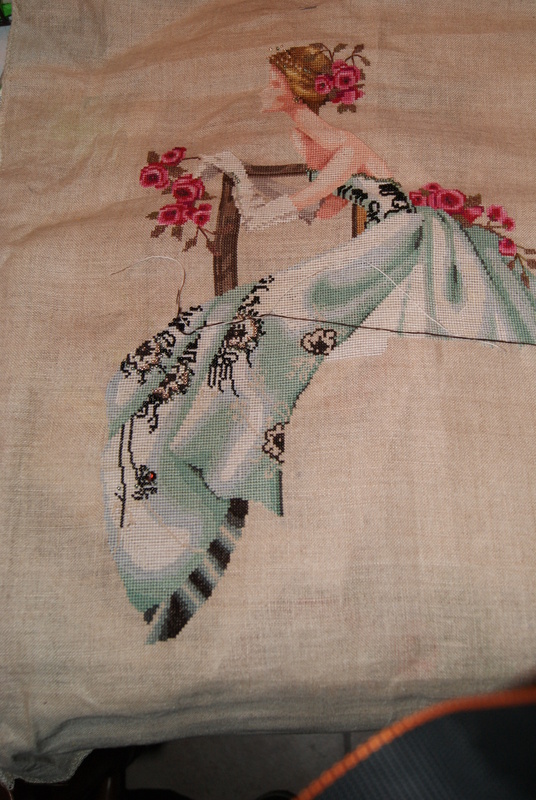 I find them a bit difficult to work with, so the stitching is slowed down some. These threads tend to tangle, break easy, and fray, but the look of them is amazing. I just love how the finished project sparkles. 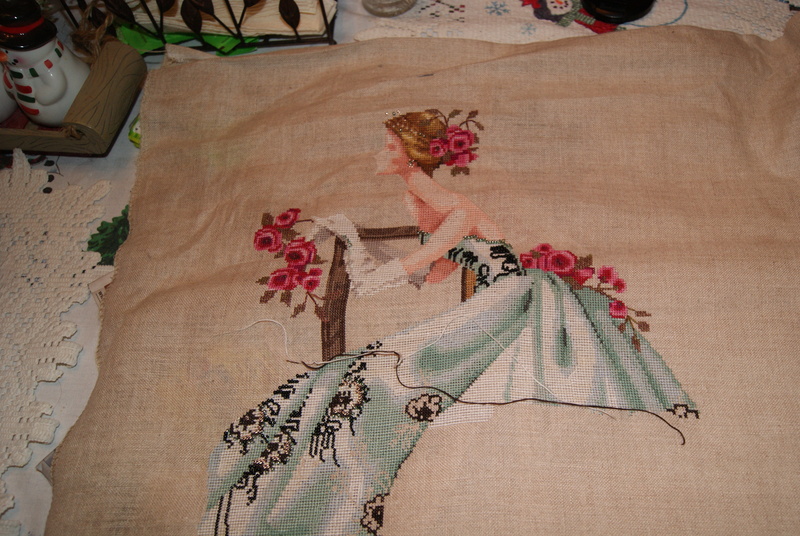 And here is after my second stitching session yesterday afternoon. 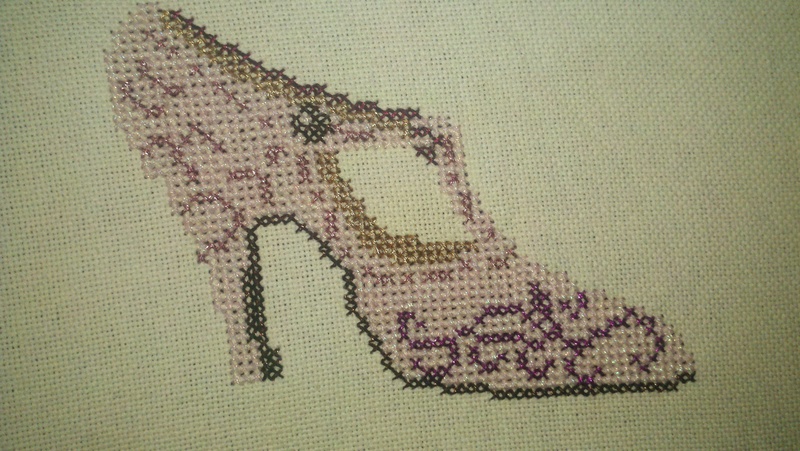 Now you can see the shoe start to take shape and how the colors contrast nicely together. 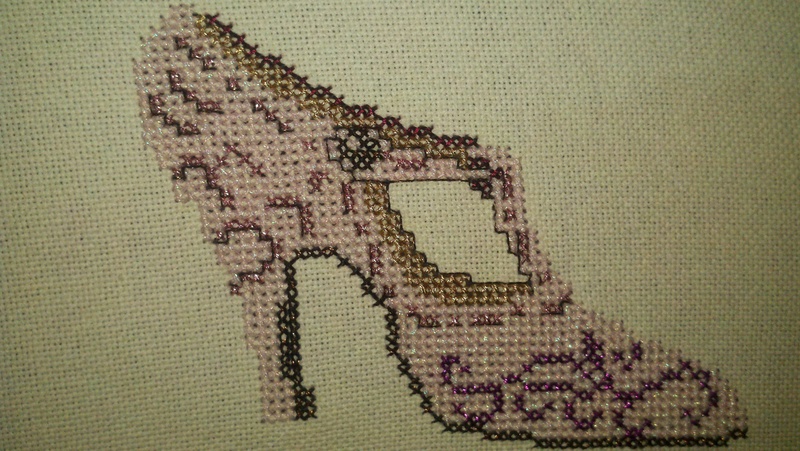 I continued the jigsaw method here by filling in more of the pink and then adding in the gold and the dark pink accents in the upper part of the shoe. 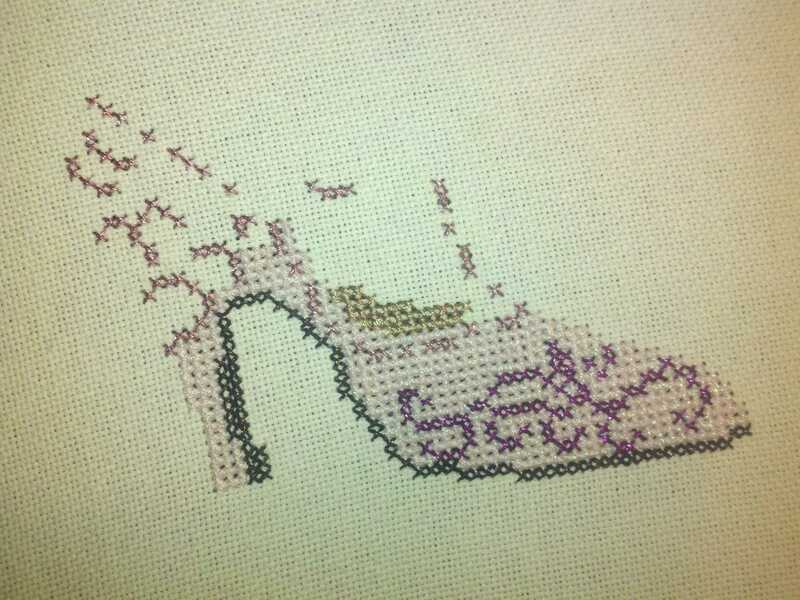 And I stopped last night (3rd stitching session) with 46 stitches and backstitching to go. It’s almost there but you can see that it starts to blend together a bit. As before I continued filling in the pink, extended the gold up through the top of the shoe and then added the line of purple along the top and the buckle work. So this morning I finished the 46 stitches. So here is the show without the backstitching. I didn’t count out the last 46 stitches, all jigsaw method of just filling in the stitches in comparison to what has already been done. As you can see, the small details, like the buckle strap and the inside of the shoe are not accentuated and are difficult to see. Gorgeous and I want a real pair! Now to cut down the fabric, mount the picture, and add it to my frame. I haven’t updated in a while because I have been busy moving across 3 states, job hunting/becoming self-employed, and I have not been reading or cross stitching as much as I like. But I do have an update of progress on Sabrina.